In the midst of the devastating Californian drought, one woman is proposing that we reintroduce beavers to L.A. County to mitigate our water problem. A couple of weeks ago, Britt Sheflin, a 37-year-old private chef for software startup company Oblong Industries, submitted her beaver campaign to GOOD Maker—a platform for social action—as one of the over 70 proposal entries for its "LA is the Best Place to Live" competition. The challenge encourages people to submit ideas, projects or programs that would make L.A. the best place to live today and in 2050. Voting for the competition ends on Nov. 3, and the winner will receive $100,000 to work on their project. Sheflin's plan is to reintroduce the North American Beaver (a.k.a. castor canadensis) to "to key areas where we need to control drought, flash floods, and further loss of fish and wildlife habitat," she writes on GOOD. Sheflin suggests that the ways these "hydro-engineers" could benefit L.A. County includes "intensive water filtration, drought 'savings accounts' created by the deep, topographically varied ponds, and naturally rich soil that is dispersed throughout regions where beaver reside." If she wins this challenge, she would use the money to conduct research, work to advocate with policymakers, manage the project, and bring people who have handled the beavers on board. Sheflin first heard about the beaver reintroduction program on NPR while driving to work one day, and that launched her interest in researching more about it, she tells LAist. She says she grew up in Alaska where there are a lot of beavers, so she's familiar with beaver habitats and how they can affect an area. This idea came to mind also because of her daughter. "My sweetheart and I have a 15 month old daughter, and I think a lot about her future," Sheflin says. "One of the things that really got me to understand how important it is to reintroduce beaver as soon as possible, was trying to imagine her future as an adult with millions more people in Southern California and no other viable solutions to our water ecology. "Another big factor in my thought process was the fact that my grandfather was a game warden in OC back in the '50s. There weren't wildlife rescue centers anywhere near there back then, so it fell on the game wardens to take care of the sick and injured animals. There are wonderful family photos of my dad and his siblings playing in their backyard with the deer, hawks, eagles, and other wildlife rescues. We have lost so much habitat since then! I feel that it is incumbent upon us to solve the water and land issues we face." The flat-tailed, bucktoothed animals once thrived in North America, until their population drastically dropped in the 1930s, mostly due to fur trapping, according to the New York Times. Others saw them as rodents and pests, especially to landowners and developers, leading to them destroying the beavers' dams. The animals used to play a major role in hydrological systems. "The valleys were filled with dams, as many as one every hundred yards," Jeff Burrell, a scientist with the Wildlife Conservation Society in Bozeman, Montana, told the Times. "They were pretty much continuous wetlands." Researchers see the benefits of the beavers, especially in regards to restoring the salmon population and bringing in drought resilience to the landscape. "Beavers aren’t actually creating more water, but they are altering how it flows, which creates benefits through the ecosystem," Michael Pollock, an ecosystems analyst and beaver specialist at the National Marine Fisheries Service Northwest Science Center, tells Water Deeply, a news website about California's drought. By gnawing down trees and building dams, beavers create small reservoirs. What follows, scientists say, is a series of trickle-down benefits: The water that might otherwise have raced downstream to the sea, tearing apart creek gullies and washing away fish, instead gets holed up for months behind the jumbles of twigs and branches. In this cool, calm water, fish — like juvenile salmon — thrive. Meanwhile, the water percolates slowly into the ground, recharging near-surface aquifers and keeping soils hydrated through the dry season. 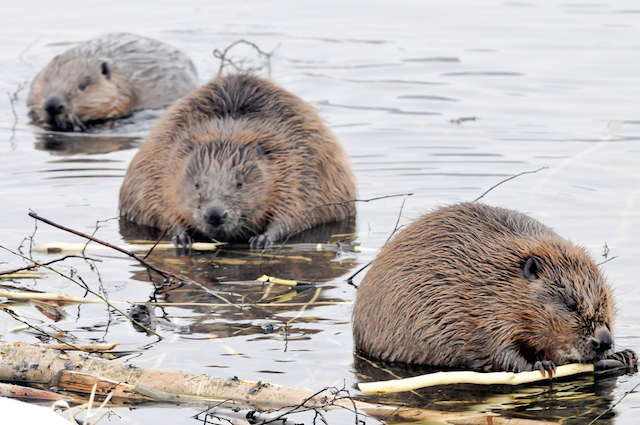 Not everyone is convinced that beavers can solve our water problems. Kevin Shaffer, a fisheries biologist with the California Department of Fish and Wildlife, told Water Deeply that although he believes beavers can temporarily help out in a watershed that hasn't had rainfall in some time, but in the long term, they can't correct the areas that have long-term drought or climate change. They may not be able to help out a seriously stressed environment, or may even get into conflicts with humans, in terms of them taking over properties and trees that could fall into roadways. "As the drought gets worse, their ponds will dry up and the animals will just move somewhere else," he says. "They won't stay because there is no more water." Julian D. Olden, an ecologist at the University of Washington, has studied new beaver ponds in Arizona, finding that invasive fish took over these ponds, displacing the native species. "There’s a lot of unknowns before we can say what the return of beavers means for these arid ecosystems," he said. "The assumption is it’s going to be good in all situations," he told the Times. "But the jury is still out, and it’s going to take a couple of decades." However, bringing beavers back into an environment has had some positive effects. Over in Methow Valley Ranger District of the Okanogan-Wenatchee National Forest in north central Washington State, U.S. Forest Service biologists have spent the last eight years reintroducing beavers to streams where they once lived. From 2008 to March 2015, 240 beavers have been relocated to 51 sites in Washington, NBC News reports. 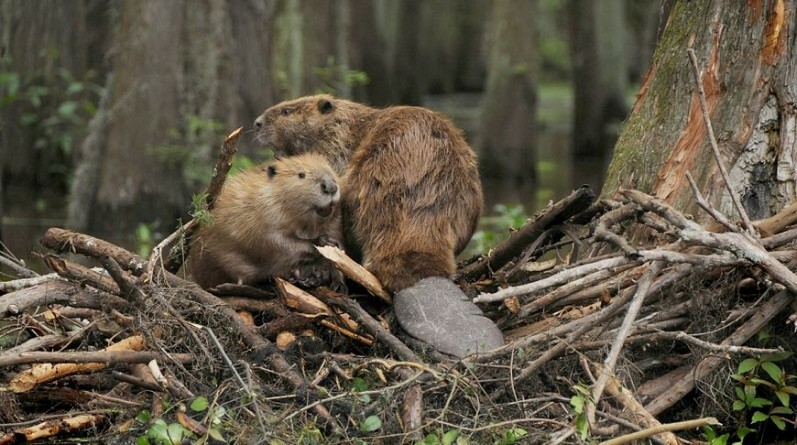 "By moving beavers higher up in the watershed, it enables them to store water. It will decrease water temperatures and help restore complexity to our streams," Heide Andersen, a Methow Conservancy Stewardship Director said in a video interview, which can be seen below. Pollock told NBC News that it's cost effective as well, "citing a study that found that using beavers costs a fraction as much as conventional stream restoration." Sheflin also refers to the the beavers in Martinez, California as an example of a successful watershed program involving beavers. Back in 2008, a family of beavers began living in the area's Alhambra Creek, according to Bay Nature magazine. While some were afraid the beavers would cause flooding and wanted them out of the area, the City Council voted to let them stay. Since then the beavers have helped create habitats for other species, and keep a healthy watershed. Voting for the Good Maker challenge ends on Nov. 3 at 12 p.m. PDT. If you want to vote for Sheflin's bring back the beaver proposal, visit this website.